In may wayward youth, as I focused on writing and performing, I wound up taking a lot of side jobs while other people built meaningful, lasting careers. Some of them were your standard barista/pub worker jobs, but there was a litter of oddities… jobs that now appear as mysterious blanks spaces on my resume. But here’s a little peek at part of the resume behind the resume – a few of the jobs on my secret resume. Security at a dive bar: It was one of those bars that was a dive, but also being discovered by hipsters. 90% of the job was laughing at people’s pathetically fake ID’s and walking around a rainy parking lot late at night. There were frequently fights, but usually just chest-puffing nonsense. One night a bartender got part of his ear bitten off. Apparently it has to do with the pool tables. “If there’s pool tables,” the manager told me, “there’s fights. It also paid just nothing, especially for what the job potentially involved. Submarine tour guide: This was for one of the last non-nuclear submarines, permanently docked in Portland: The USS Blueback. I can still smell the fuel and body odor if I think about it. Fascinating job – I’ll occasionally still dream about the sub, and its living conditions. One drawback though was that employees trained new employees, which meant the information took on a certain “Telephone Game” quality after a while. Every week or so I’d do a little “fact-checking” mission with the manager, that often had me worried he’d burst a blood-vessel. Tree farm-hand: Just out of college I worked for a while on a tree farm. There were two owners who split everything, including the employee budgets. My boss hired me. The other boss hired 4 workers from Mexico and Central America. They were working when I got there, and working when I left. Very nice guys, but – understandably, for being here illegally – very shy. 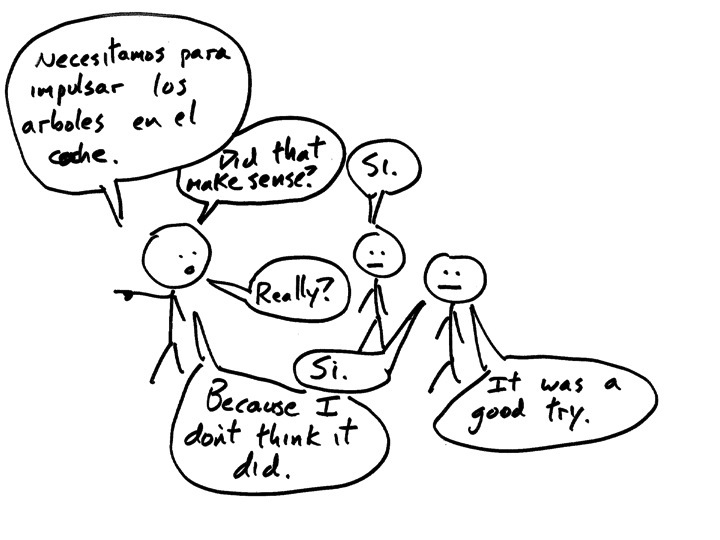 I thought it would be a great opportunity to work on my Spanish, but they were too polite to ever correct me. I loved being outdoors all day. The job was often the most intense physical labor I’ve probably ever done, peppered with occasional silent calm – like hand-watering or pruning, Bonsai style. These were the days my girlfriend inevitably visited – hoping to see muscles flexing under a sheen of masculine perspiration. ← Let’s Be – air quotes – Adult About This, Shall We? Good stories and experiences. Why would you ever want to hide them from your full resumé? That’s me be hypocritical. I don’t put my job cleaning in a hospital on my own even though mopping the long corridors with the light pouring down through high windows and the gentle clinking of hospital trolleys going by is the closest I have come to Buddhist enlightenment! There needs to be two resumes: the “I want this job” resume, and the “I’ve had an interesting life” resume. I tell you, though. For this not being a post about Oregon, it sure does make me nostalgic for the state. Maybe there’s just something very Oregon about my jobs? Trees… OMSI… dive bars being overrun by hipsters… yeah, I can see it. The hard part is reminding myself that it’s okay to do them quickly – to not feel the need to carefully craft “perfect” stick figures. It should come as no surprise that both David Sedaris and John Cheever worked as submarine tour guides at one point in each of their lives. You’re on the right path! Really? I had no idea. That’s interesting. Umm…sometimes I make things up. Your girlfriend days are my every day. My money’s on Batman. I was not going to do WordPress today but this was in my mailbox and I had to know. Just had to know. Thank goodness for my pathetic lack of willpower. You’re so funny. Well, thanks! And I don’t know – Batman and Vader would be focusing on each other and then? Bear time. You’ve given me much to think about. My employer thanks you. I’d vote Batman as well. Because he’s Batman, that’s why. But who would win in a fight against Darth Bat-Bear? No one. That’s who. Your next post will be about your job as an illustrator, right, B-Man? No, sadly, my talents are largely unnoticed beyond a self-portrait in some high-school state art show thing. I once had a temp job at the Cleveland Museum of Art explaining how to use a walkman for those wishing to wear one while looking at the Faberge Egg exhibit. You would think explaining “green means play” “red means stop” would be pretty self-explanatory, but no…no. There needs to be a part two to this, for many, many reasons, but mostly so we can find out what your going rate is for handling knife fights. This was just great. And Johnny Schneds (that’s my dad…obviously) must never, ever hear of this submarine gig. Holy crap. You’d have my whole family FB messaging you. Oh, and you know what I forgot to talk about? The tour guides who treated it like they were, in fact, Navy men because they worked on it and hosted sleep-overs for kids and wore little sailor uniforms. Those Navy guys are crazy like that. I’m always nostalgic for the things I hated at the time. Stick figures rock, great crativity! This was a hilarious post. Thanks. And they are an unappreciated art, aren’t they? Love the details, tone and art! Smashing! Sorry, my cynical perfectionism slipping out, there. Those were interesting jobs. Not many people could put such jobs on a résumé. I particularly liked the tree farm as my brother owns a tree farm and does much of the work himself with the work supplemented by friends whom he also pays to help him with his stone cutting business and his Southwest import business (he is quite the businessman). So you quite a lot of experience, quite varied. Who wouldn’t want to hire you? You really are a jack-of-all-trades, aren’t you? Master of none, as they say. That’s me. 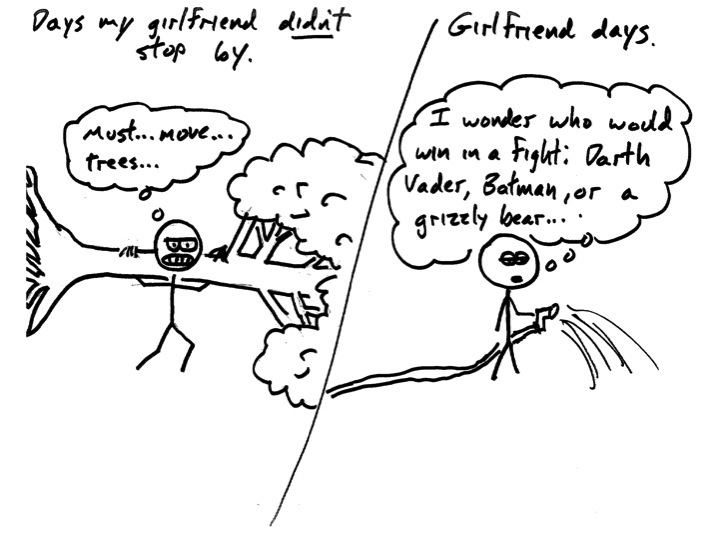 I love the stick figures! They’re so bad (no offense) that they’re excellent. On the first one of these I did, I spent a ridiculous amount of time getting the drawings just how I wanted them. Afterward, I decided it was way too long to spend on them, plus it seemed like part of the point was for them to be quickly drawn. Yeah, I think it actually makes them funnier. Couldn’t you just make this into one fabulous job on your resume? You were a security guard/tour guide for a submarine tree farm that had the rowdiest bar fights. The tree farm is hydroponic. Ya know, cuz it is inside the submarine. I’m not sure where the pool tables would go just yet. It’s early — I haven’t finished my coffee. Tree-top billiards. It’s the latest thing! oooh … can I play via zipline and then disconnect into the water a la cannonball?? OMG, were those guys playing pool with someone’s legs?!?! Yeah, yeah, yeah. And they’re playing without any pool balls either, I know. 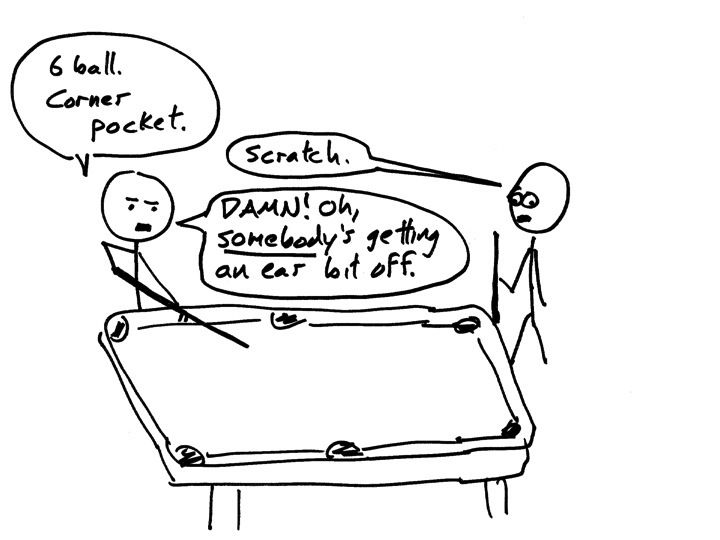 I’m guessing that ball-less pool players start fewer fights, am I right? I know, I know. I’ve thought about fixing that, but it seems like a lot of effort. So what did you end up deciding? Vader, Batman, or the grizzly bear. Think carefully. I think they’d recognize their mutual-awesomeness and team up. Then Trinity from The Matrix would join them and It’d be the best Superhero team ever. Thank you for the laugh. I love the submarine Tour guide info. That was priceless. And I will tell you this…..I have it on good authority that sub humor is incredibly dark, and mostly sexual. I will not reveal how I know this. (ok, fine….Darth Bat-Bear told me). I once had a job at a swim club…..enclosed in a plastic kiosk making cotton candy all day. By the end of the day, I was coated in a thick skin of hardened sugar. I am not a big fan of sugar. Probably an excellent long-term diet aid, though! What educational jobs you had! 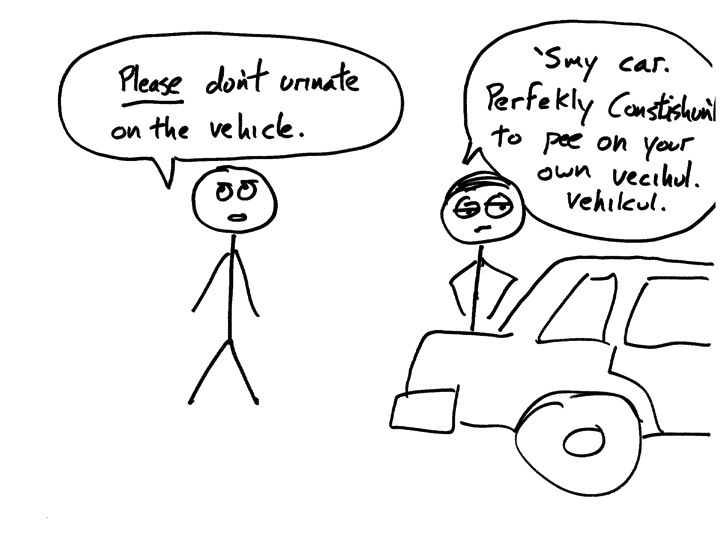 Like the Supreme Court justice who schooled you in the laws relating to self-vehicular urination. You can’t get THAT kind of knowledge at any college. Also, if you preface anything with “My lawyer has advised me” before anything you say while intoxicated, it’s legally binding. Darth Vader. For sure. We’ve debated this on the way to school. However: he wouldn’t beat a jack-hammer because concrete would beat Darth Vader and a jack-hammer beats concrete. I am pretty sure a jack-hammer is like pulling out “dynamite” during paper-rock-scissors. We also learned that the proper plural form of platypus is both platypi and platypuses on the way to school. There you go. He has a red light saber, dude. Force-choking aside, the light saber increases his danger zone by at least another eight feet in diameter. Bear can’t get close enough to touch Vader, even if he can withstand the force-choking. You’re out of your depth, man: I have three sons from 5 to 11 years old. I am a Jedi in my own right. Plus bears don’t have mind control over droids. Just sayin’…. Me either. Every few years I try a goatee and it always surprises me when it look awful. Sounds very familiar. I’m going to keep a note pad around me when my guy starts telling his “war stories” just to keep track of all of his odd jobs–and I do mean “odd!” I never met a man that was fired from so many jobs! Was it hard to get Patrick Swayze to star as you in the documentary about a rogue bouncer who helps stop pool table violence in the film Road House. It really was. Especially because he wasn’t fit enough to accurately represent my physique. Definitely Batman. Darth Vader wouldn’t even know he was coming. He would be constantly checking behind him around every corner for weeks, MONTHS even, and just when he thinks that maybe Batman isn’t coming after all… BAM! Strung up from the ceiling beams! It’s true that Darth Vader kills, and Batman doesn’t (anymore), but Batman could just keep coming back and beating the crap out of Vader, while Vader would never get in a shot of his own. On the subject of Batman, every time somebody refers to you as “B-man” i hear it in Harley Quinn’s voice (from the Arkham series). Then the bear would swoop in. I’ve never worked security at a dive bar, but I do ride the subway every day so…I’ve seen a guy who had part of his ear lobe bitten off by his girlfriend. (She had also stabbed him with a pocket knife just above his left kidney.) I should add “subway rider” to my resume. I got some mad skillz. They do seem to be a larger part of our economy than would seem reasonable. These were great. I love old job stories! Like when they do those “before they were famous” deals on TV and you find out that John Mayer used to be the dude that you pay your money to in the parking garage. I see your submarine tour guide and I raise you my totem tour guide. I lived in Ketchikan, AK and had to approach elderly cruise ship tourists and tell them the legends of the totem poles in the state park where I worked. Oh the stories I could tell! I mean really. About Fog Woman, and Raven Princesss….and yeah, even Thundering Wings. All of them. You’ve got to blog about this Fog Woman. Do it for me. by the way…I can top your wacky job. I used to have a job chasing Ross down the street wearing a Yankee Candle apron and a Chef-boyardee mustache. Best part about that is you could make up anything and they’d go for it. Probably find it very profound. And I always suspected you were Inuit. Inuit! You are good. Most people would say Eskimo. You probably are therefore aware that Alaska also does not accept Russian coins. Believe it or not, this is news to some. We all must have that “other” resume, though not all of of us can claim the danger and thrills of yours. Mine consists mostly of fending off drunks at Pizza Hut, wiping bottoms and making fruit baskets in a refrigerated warehouse (or was it fending off fruit baskets and wiping drunks?). One of the greatest student papers I ever read was a kid who got fired from Chuck E Cheese Pizza. He was Chuck E, and filled the mouse head with helium to have a funny voice, being unfamiliar with the human need for oxygen. He passed out and when he came to kids were panicking because Chuck E was dead. Uh…yeah. What is up with the Oregon jobs? Duuuude. I laugh because my older brother lived there for years and he always had these bizarre jobs you would never find in Maine…once he worked at a winery. Once he was a mountain bike tour guide (??) Once he distilled beer. Not for money, just out in his shed. Sigh. I want to live in Oregon now. Also, my husband was a bouncer at a bar and he also quit the day his boss gave him ‘training’ on what to do when someone threatened to knife him. Oh, I almost forgot. This has nothing to do with anything but I’d like to take this moment to file a complaint with you. It seems I’m receiving numerous emails from a certain social media site that feels obligated to keep informing me I should follow various tweeters simply because they are ‘similar to The Byronic Man’. I’d like to kindly ask you to cease and desist with the twittering madness or I will be forced to get sucked back into the black hole that is Twitter and start tweeting up a twit storm. I really have zero willpower. So this is all on you. Oh my God. The home brewers. Seriously. The home brewers. Not much inspires dread like, “Hey! I brewed some beer! You want to try it?” You’ve got about a 90% chance of drinking something that tastes like a fermented area rug. Most definitely. Wackadoodle beer freaks out there in Oregon. And I see you’ve carefully sidestepped my twitter rage comment? Don’t make me have to follow people. The disgusting photographer photo shows up in my reader twice to scare me half to death and these brilliant stick figures were no were to be found…there is something seriously wrong. Man, I wish I could draw stick figures! You are so very funny 🙂 Also, when are you going to do another flip story? What’s it called – when we get to vote on the next action? Awesome! And that’s just my psychic sense…that never correctly picked which story we were going to follow next, lol. One of my great uncles was killed in a submarine serving in the Pacific during ww2. The USS Shark. It was sunk by depth charges dropped from a Japanese destroyer off the coast of Taiwan, which resulted in “bubbles, heavy oil, clothes and cork” coming to the surface (the part in quotes is from the log book of the destroyer). Also, right before it was sunk it torpedoed a Japanese freighter that was acting as a prison ship, the Arisan Maru, killing 1,781 US and Allied military and civilian POWs. 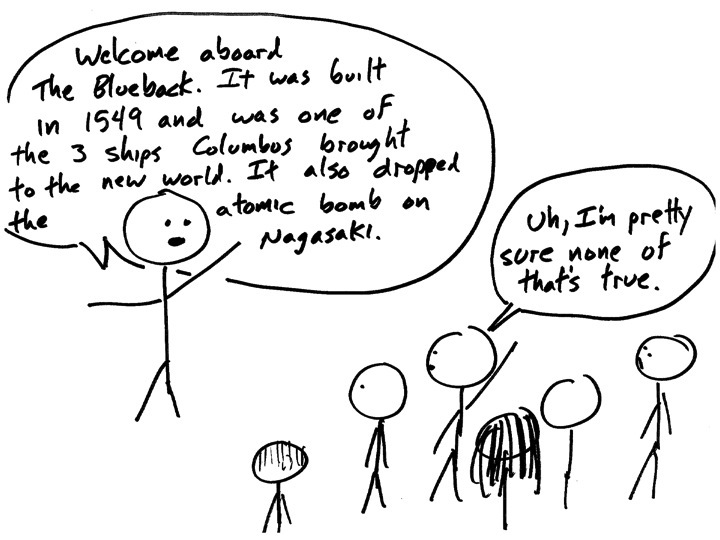 The sinking of the Arisan Maru still represents the greatest loss of American life in a single military sinking Ooops. I can’t even imagine meeting your death like that. I know you haven’t mentioned your modeling experience here, but from the pictures above I can see that you have the same stick figure physique most models are known for. Oh, and FYI: I have submitted your secret resume to my secret HR. You’ll know it’s them if you get a missed call from unknown number. Oh, is THAT who called? Glad I didn’t pick up, or I’d have screwed up everything. As an HR Specialist, I say you include these jobs on your resume in your next job search. People like me NEED something to laugh at and appreciate!!! But maybe not include the stick figure drawings. GAH! Just kidding! You should TOTALLY include the stick figure drawings!!! I have a few secret resume jobs too – something about being a theatre major that seems to encourage it! The best two are probably life model and professional fairy. When I do put them on, they certainly make for an interesting interview! Yeah, let the engineers and lawyers of the world have their “stability” and “futures” and “money.” They’ll never know the joy of weird, underpaying, meaningless jobs. This was a great post! I feel like us creative types are always more likely and willing to do weird things for money while working out the kinks in our real plans. True. I could do with a few less kinks, though. Wait. 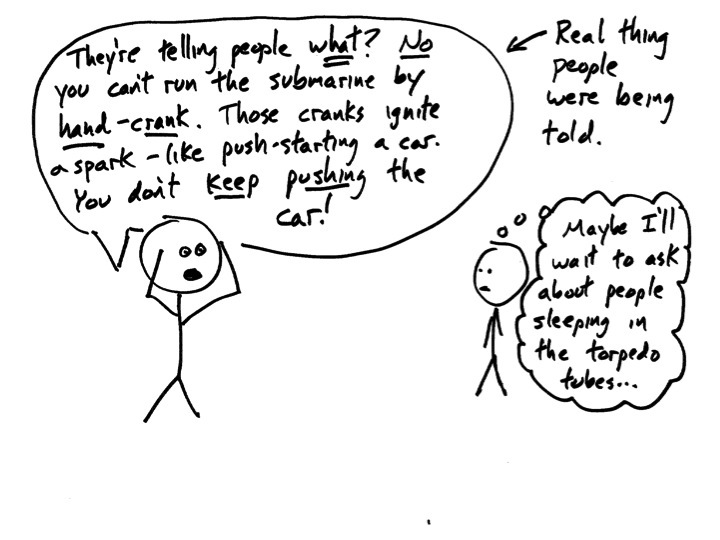 People did actually sleep in the torpedo tubes, right? Don’t tell me I’ve based my existence on a lie. Of course they did. Of course they did. They’re heated, and have little lamps. 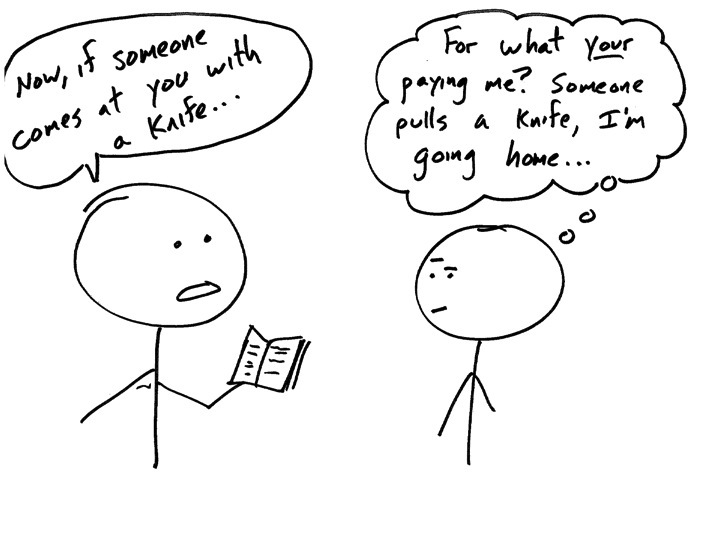 yet another humorous post from one of my favorite sites, the byronic man. and, yeah, i’m typing in all lowercase b/c i’m in a sling. in any event, this made me laugh out loud (several times) the other day and i’ve decided to spread the joy. if you aren’t familiar with the byronic man’s blog, go on and mosey over–now! i promise you, it is hilarious. Well, that’s extremely kind of you – sorry about the sling. You’re welcome. Carpal tunnel surgery (one of two “fun” procedures). So far everything has gone okay though. I think we’ve all had our fair share of ‘secret resume’ jobs. My secret resume would include the terrible 2 weeks I spent as a housekeeper of some guest cottages a province away from my home city… only they didn’t have any gloves or other cleaning supplies there. Just some mint-scented spray of sorts. My first day was spent assembling a barbecue BY HAND (again: no tools! ), and Days 2-14 were spent trying to explain to my employer why I wasn’t going to clean out the toilets using nothing but my bare hands and the sketchy mint spray. Day 15 was when my mom finally came to pick me up and take me home. Ugh. The memories! I worked at a carrot farm one year. Sorting/bagging carrots was probably one of the most boring things one could imagine, but I was able to put that time to good use working on story ideas. I was told at the end of the season that they considered firing me on several occasions (I was always being reprimanded for being too slow). I am sure the people I met and the experiences I had will prove helpful in a story somewhere along the way. That would be a kind of embarrassing job to get fired from. Well, it wasn’t my dream job by any means. It served a purpose and I am grateful for that.